California voters who choose to vote by mail are being urged to return their ballots on time and sign their ballot envelopes. The only thing worse than people not voting is people trying to vote and having their ballots go uncounted. “Voting by mail has grown increasingly popular, but we are also seeing a significant number of mail ballots cast that do not get counted,” said Kim Alexander, president and founder of the California Voter Foundation (CVF), a nonprofit, nonpartisan organization working to improve the voting process. 1) Return your ballot by mail a week prior to Election Day. Ballots must be received by 8 p.m. on Election Day by the county that sent it. Unlike a tax return, postmarks don’t count. 2) Voters who do not mail their ballots a week before the election should return them in person. Ballots can be returned to county election offices or to any polling place within the voter’s county on Election Day. 3) Be sure to sign your ballot envelope. 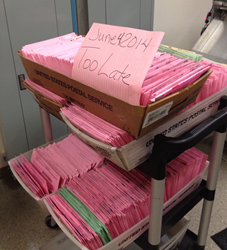 Ballots sent in envelopes lacking a voter’s signature will not be counted. 4) Sign your name the same way as when you registered to vote. Voters who register online should check their driver’s license signature to make sure their ballot envelope signature will match. 5) If you make a mistake or lose your ballot you can still vote. Voters can seek replacement ballots from their county elections office or get a provisional ballot at their polling place on Election Day. “The only thing worse than people not voting is people trying to vote and having their ballots go uncounted,” Alexander said. “Voting by mail provides a great convenience to California voters, but every statewide election, tens of thousands of ballots go uncounted. By following these five tips, we hope to reduce the number of uncounted ballots and ensure more valid votes are cast and counted,” CVF’s Alexander said. A recent statewide study of uncounted vote-by-mail ballots found that while 99 percent of the mail ballots cast in November 2012 were counted, 1 percent were not, representing approximately 69,000 ballots cast that were rejected. The study, conducted by the UC Davis California Civic Engagement Project (CCEP), found that most of the rejected ballots arrived too late to count, lacked the voter’s signature on the ballot envelope, or the signature did not sufficiently match the voter’s signature on file. The uncounted ballots rate rose to nearly 3 percent of all mail ballots cast in the June 2014 primary according to the CCEP report, amounting to an estimated 91,000 uncounted ballots in a record low-turnout election. According to the Pew Charitable Trusts, California’s mail ballot rejection rate is among the highest in the nation. The California Voter Foundation's August 2014 report, “Improving the Vote-by-Mail Process, a Three-County Study” features recommendations for improving the process to ensure more ballots cast are counted, such as notifying voters when their ballots go uncounted so they can avoid repeating the same mistakes.